Your toddler is most likely a picky eater, or never sits in a single place until he/she has finished his/her food. Parents run behind them with food in their hand, trying so hard to get them to at least taste the food. All parents would have faced this situation at one point or the other with toddlers. Another problem commonly seen in toddlers, is that they seem to like one particular food one day and eat well and the immediate next day, for no apparent reason, they reject the same food that they seemed to like so much. If your young child has the above eating problems, don't despair. It is a part of growing up. Feeding is a battle which most parents would have fought with their toddlers and lost. We need to understand that toddlers have a strong sense of self and they insist on doing things their way. Try new foods. Vary your toddler's diet in texture, taste, colour and temperature. Encourage your child to try new foods. Like adults, toddlers appreciate a variety in cuisine. They may enjoy a sandwich or some pasta for a change, instead ofthe regular food you give them daily. Be creative. Serve foods they dislike in a little more creative and unusual manner and in delightful ways. For example, if they don't like vegetables, cut them in different shapes or make them into crunchy finger foods. Minimize spices. Don't serve heavily spiced food to children as most of them don't like very spicy food. Your child may reject a particular food entirely in the future if he has a bad taste experience because he tasted it heavily spiced the last time he had it. It is better to taste the food yourself before you serve the child to avoid such situations. Set regular mealtimes. 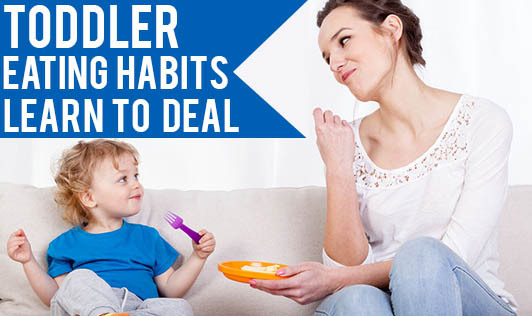 To prevent your child from relying on erratic snacks to curb hunger, try to maintain regular mealtimes. But you should also keep in mind not to keep him hungry to fit into your routine. Just because it is 12.30 p.m., the time you have set for lunch; does not mean he is also hungry and wants to eat. You can be a bit more flexible with timings. Be more flexible. Do not have a fixed idea that your child HAS to have this particular food for lunch or breakfast. It is fine for them to have breakfast snacks for dinner and have their lunch for evening snacks, as far as they are eating something healthy. The whole day's intake should match their requirements. Be a role model. Children love to imitate, and they usually do what they see their loved ones doing. Your young child should see you consuming healthy foods and limiting sweets, salty snacks, and aerated drinks yourself for them to follow the same. - "I eat one spoon and you eat one too" and let's see who finishes first. - A game - "I will feed you and you feed me"
- Arrange food in the shape of a car or a castle and say "now lets see what does the big giant want to eat - the tyres or the seat." - Arrange the food as cars or aeroplanes and let the child imagine that his mouth is a garage or hangar and let the food zoom in or fly in! Using some of the above tips, I believe a major part of your toddler eating problems would go away. Continue to explore new methods; trial and error is the best way to find what works best with your toddler. Do this and you will appreciate the time you have with your young children.